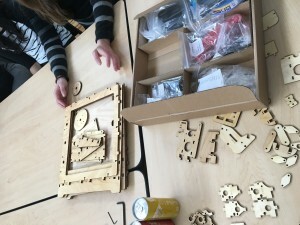 This week we had a quite challenging assembly workshop at the BIF atrium. 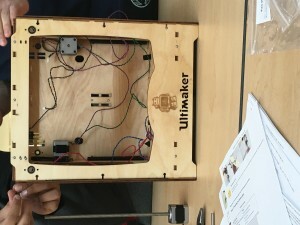 My group’s task is to build a 3D printer out of a knit. 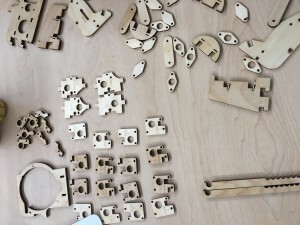 Frankly, at the first sight, I was thinking there is no way that we are going to put it together during the class time because there are literally hundreds of different pieces: things like wooden joint parts, nails,wires. It turned out I was not wrong, but we did accomplish way more than I expected. One thing I learned from the assembly process is that it is so important to have step-to-step instruction that pertains to the exact printer we assembly. The instruction we had was a out-of-date one, so it was very confusing at certain points where the way things were put together already changed from version to version. The other thing I have learned is that it is probably not a good idea to have more than 2,3 people to work on the same part. Once there is too many people, efficiency starts to decrease, but I do appreciate everyone’s spirit in wanting to contribute. I guess after this workshop I have more respect towards industrial designers and towards technology. Those people are definitely genius and they are able to design such meticulous structures. And I will definitely appreciate the fact that I can just buy complicated machines such as personal computers and stuff instead of having to assembly them myself. I guess now when my computer or ipad failed, I would probably have less complain because it’s just not easy to put everything together and making sure it will be working perfectly. This entry was posted in Reflections by jchen123@illinois.edu. Bookmark the permalink. I totally agree when you say putting things together changed your perspective on how things work in the end. At least we had instructions but for most inventors it’s a guess and check game, guessing whether or not something will even work out in the end! It sure was challenging to build the kit with outdated instructions, but I’m glad we put our heads together and persevered. Nothing says ‘maker’ like building something with your intuition and the help of like-minded peers!